Hello, readers! June of 2012 proved to be the busiest month I’ve ever had in terms of live music experiences. It all began with a fortuitous moment on Twitter, where my 90s teen self reared her head and promptly snagged a NXNE Priority Pass. For the first time, I was going to be able to truly roam and enjoy the festival. Definitely made my month brighter. Bonus Factoid #1: No! Sleep! All Week! Bonus Factoid #2: I skipped my own convocation and I am not even remotely sorry. Speaking of that aforementioned 90s teen, she was well nourished this month. Between NXNE and the Toronto Jazz festival, I was able to cross off three artists I’d always wanted to see from that era of time: Bran Van 3000 (My favourite cheese is Havarti); Holly McNarland (Stunning talent and gracious to speak with post-show as well); and Joan Osborne (The pipes! *drops to ground*). Music has been an essential life force in my life, so it was wonderful to be able to see the artists from my troubled teen sonic landscape. June was a month of discovering new music and adding new favourites to the roster. I can’t say I saw an artist I didn’t enjoy at least somewhat (although I did have a few disappointments, diverging from popular opinion), which is impressive considering the number of shows I’ve seen this month. I did have my favourite new discoveries, of course. Care to hear about them? Future History: I cannot stop spinning their CD, which I will be reviewing in the very near future. If you’re in the Toronto area, they’re playing a show on July 6th and I suggest you make it a priority. Avery Island: Their EP is forthcoming, so alas, I cannot yet spin it endlessly. Fantastic band, with a show coming up in late July at Lee’s Palace. Get on that, too. Nash: Another new CD acquisition and I am in love. It’s perfectly summer and yet, there’s enough depth for introspective autumn. Zulu Winter: Believe the hype. Fabulous live show and their CD Language is tasty retro-tinged goodness. Art Vs. Science: No longer the band with that fun song to sing on the fiance’s NBA game, they are officially kings of cool. I danced so much to their set and just could not stop marveling at their stage presence. Mira Black: Moving in to fill the void that lacklustre albums from Tori Amos and PJ Harvey has created in my musical life, Mira is breathtaking. Love her CD. Love her voice. Amos The Transparent: Um, where the hell have I been? Oh, that’s right: I wallowed in a strange “No new music!” cave last year for reasons even I cannot articulate. I apologize. I capped my NXNE week off with this band and it was an amazing finale. Janelle Monáe: I don’t listen to radio. I kept meaning to check out the guest star on Fun.’s big hit, but I slacked off. I apologize for this too. It wasn’t all new music this month: I got to see my favourite, Matthew Good, which was a definite highlight of NXNE. I scored yet another free Metric performance, which makes up for always missing their concerts proper. 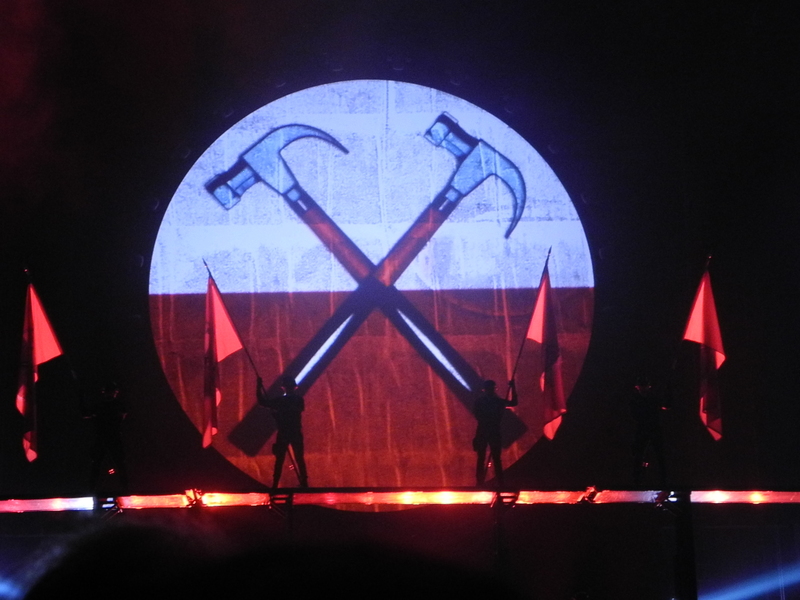 This month also brought my second time seeing Roger Waters and The Wall is still one of the best albums ever, especially performed live. If Waters is true to his word, I have seen the final two Toronto performances he will ever have. That’s epic, and I count myself lucky for having been at his shows. I wasn’t sure I’d ever have the privilege without Marty and Doc Brown helping me. NXNE also brought films with it, and I’ve had the incredible fortune to not only see several of them but also speak with the directors. It’s been a surreal and privileged month. I know my heart will be torn if several are up for the same awards. With all of the traffic this month, I’ve been humbled by the positive feedback for my writing, particularly in this month, given the release of my first published novel. It’s made countless late nights worthwhile. You all know who you are. Now, if you’ll excuse me, I’m going to go collapse a little. July will be a bit of a breather. Phew!